On-line ordering allows orderer and patient contextual information, along with laboratory test codes to be passed electronically to our laboratory systems therefore ensuring better quality information. The correct doctor. The correct patient. The correct tests. By receiving your request electronically - this will ensure accurate information is collected at source and will remove the need for manual data entry of the current request forms. You will not have to log on to our ordering system - this will be handled automatically once you are set up in our systems. How it will be done will depend on your Practice Management System. View this embedded video to see how it works in a MedTech system. The actual ordering process is similar to your current practice, with tick-boxes used to order tests. Some tests will prompt you for, or provide you with, important information. As well as common and departmental tabs there is an additional tab available to perform free text searches for less common tests. 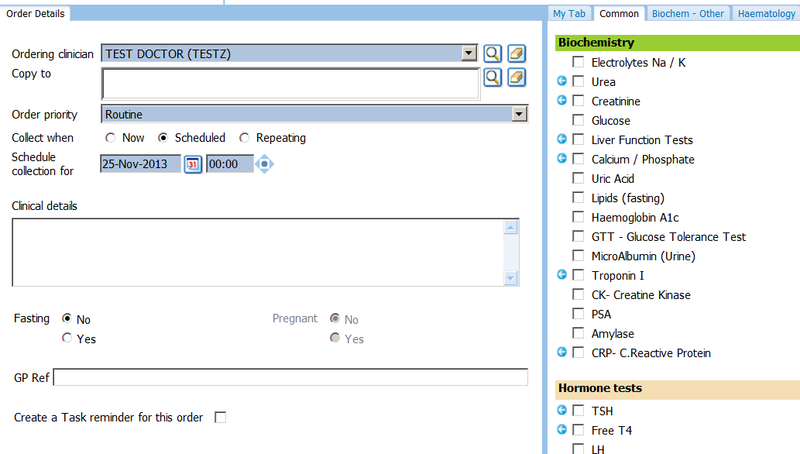 Once the order is placed an electronic message is recorded in our Eclair database, a form is printed which is given to the patient. Once the specimen(s) arrive in the laboratory the order is matched up with the laboratory request number and all the ordering and collection information is available for laboratory staff. Pathlab encourages clinicians to register and begin using online ordering. Quality information sent to the laboratory - by collecting electronic data at source we are eliminating data entry errors that can occur when our staff read and enter request form data into laboratory systems. Patient details are sent automatically by the system ensuring we have the correct information. Up-to-date specimen specific collection information for your patients - no need to print out separate collection information for your patients. Collection information that is printed on the forms will be current laboratory practice so this reduces the chances of errors in collection and will reduce recollecting of specimens from patients. Ability to review your patient’s recent results while ordering - the ordering database is populated with approximately the last 24 months result data directly from the order form. You can review recent results at the click of a button . No change to your processes - most importantly this new process has been kept as similar to existing ordering processes as possible. During the ordering process you are able to review recent laboratory results on your current patient and make more informed decisions. 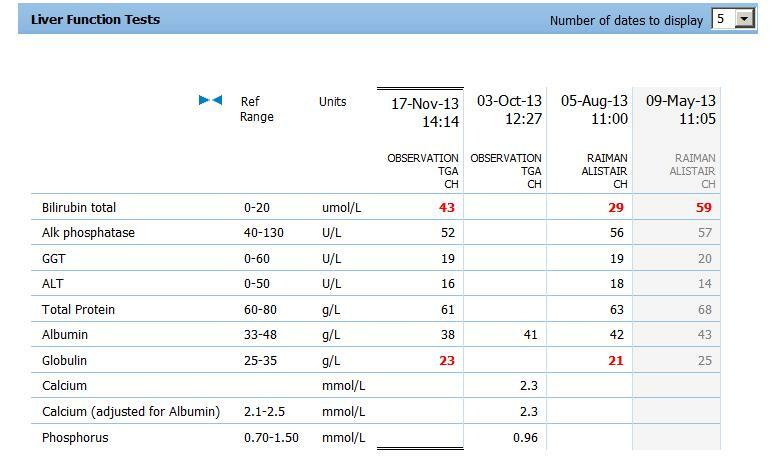 For example, clicking on the small blue arrow beside the Liver Function test select box will display past results. At any time you are able to view recent result history by using the ‘View results’ button in the bottom left-hand corner of your screen. If you have any queries or would like a visit from one of our staff please contact the Pathlab IT department on 0800 PATHLAB (728 4522) or email support@pathlab.co.nz. You may have recently received, or are soon to receive, information from MedTech about a release of their Software [Version 20.9 (Build 4127)], that allows direct electronic ordering of laboratory tests into Pathlab’s Laboratory Information System. The first time you use the on-line ordering you will get presented with an activation form, which when complete, will provide Pathlab with information to create a user account in the ordering system for you. This user account will be used by Medtech to link your Medtech user with our own codes electronically. You will not have to log on to our ordering system, this will be handled automatically.